National University of Sciences & Technology (NUST) has undergraduate programs in Engineering / IT, Biosciences, Natural Sciences, Medicine, Architecture, Social Sciences & Business Sciences. The fee for NUST comprises admission processing fee, security deposit, semester fee, tuition fee per annum and health facilities. There are additional charges which are applicable for international students. Here are the charges for undergraduate program at NUST. In order to get admission at NUST, you must appear for NUST NET 2015. It is an MCQ based test with MCQs in Physics, Chemistry, Biology, Mathematics & English. Here is test pattern for NUST NET. 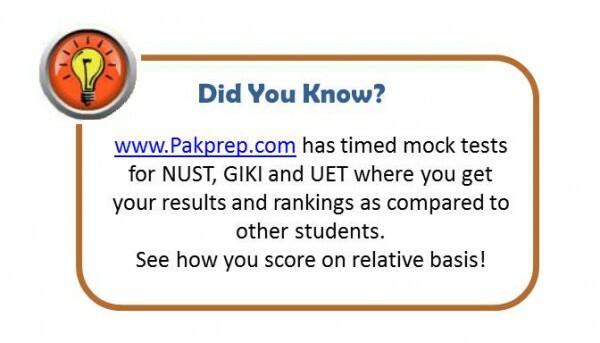 You can prepare for NUST NET using www.pakprep.com. Register here for free!! This entry was posted in NUST and tagged nust admission, Nust Admission Test, NUST Biology MCQs, Nust Chemistry MCQs, Nust Entrance Test, nust entry test, nust entry test preparation, NUST Expenses, NUST FEE Structure, nust financial aid, nust mcqs, NUST NET 2015, NUST NET 2015 MCQs, NUST NET Online Test Preparation, NUST Past Papers, Nust Physics MCQs, nust scholarships, NUST Semester FEE on April 3, 2015 by Pakprep.com Admin. A.O.A Sir i want to addmision in be avition eng.. i have dae electronices 60%marks. i am wait for your reply. A0A ; sir i have done my f.s.c in 2015…. i take 713 marks & i want admison in CAE Risalpur!! plzz tell me about the admission pr0ces & tell me when Admissions starts in CAE Risalpur?? We appreciate you interest in using Pakprep.com. NUST admission is already started and last date to apply i 21st March. You have to appear in NUST NET. Please follow the bellow mentioned links for more details and for your preparation. For further details you can call our helpline at 0335-5833265.
sir g what will the annual fee for mbbs in nust??? Please tell fee structure of MBBS of nust? Sir NET-1 ka syllabus kea hota ha? Nust NET is based on the whole syllabus of FSC, paper pattern can be found at our blog http://pakprep.com/blogs/2015/01/10/nust-entry-test-2015-paper-pattern-and-format/. For any Question on Test Preparation you may call our help line 0335-5833265. Sir when the NET-1 IS BEING CONDUCTED IN DEC 2017?? We appreciate your interest in using pakprep.com. Dates are not announced yet however it is expected in December. Please follow the bellow mentioned links for your preparation. A.O.A sir nust entrance test 2015-16 net 1 ki registration kab sy hu rahi ha. ? I WILL BE WAITING . Registration for NET-1 will be start by the mid of this month. Please follow the bellow link for NUST entry test preparation. For further details you can call our help line at 0335-5833265. What is the structue of fee for me in Civil Engineering & Machanical Engineering??? AOA if you clear your NET your fee will be around 80,000/ Semester for Engineering. Please find the bellow links for your NET Preparation. For further details you can call our helpline at 0335-5833265. Assalamoalaikum.i have done my matric from saudi arabia,federal board.and inter from karachi,federal board.can i appear in the entry test for mbbs. Dear Student, yes you can appear in MBBS admissions in Pakistan. Nust not offering MBBS Admission from this year. Army Medical college will conduct their own test in June/ July. Please follow the bellow mentioned links for you MBBS admission Guidelines. For further details you can call our helpline at 0335-5833265.
a.o.a sir mbbs ki registretion kab honi ha . NUST is not going to take MBBS students from this year. Army Medical college will conduct their own test in June/July. Please follow the bellow mentioned links for your entry test preparation. For further details please call our helpline at 0335-5833265. Are the medical seats cancelled in nust or not??? We appreciate your interest in using pakprep.com. Yes NUST is not going to take MBBS this year, however AMC will announce their own test dates in April. Please follow the bellow mentioned link for your preparation. For further details you can call our helpline at 0335-5833265. We appreciate your interest in using Pakprep.com. Please follow the bellow mentioned link for fee structure of NUST and your preparation. For further details you can call our helpline at 0335-5833265. Dear sir. My son is overseas pakistani. This year he will pass A level exam. He wants to do chemical engineering from karachi city. What will be fees for him . Please reply. We appreciate your interest in using Pakprep.com. Please find the bellow mentioned links for the fee structure and also for the preparation of test. For further details you can call our helpline at 0335-5833265. What about per semestre fee for engineering? We appreciate your interest in using pakprep.com. Semester fee for engineering in NUST is around 80,000/-. For your preparation please follow the bellow mentioned links. How manu times any candidate can appear in net? We appreciate your interest in using Pakprep.com. You can appear in all NET test there is no restriction in it, and your Best test score from all tests will be consider for merit. Please follow the bellow mentioned links for your preparation. For more details you can call us at 0335-5833265. We appreciate your interest in using Pakprep.com. NUST university is not taking test for MBBS any more, now NUMS will take test for MBBS & BDS. Please follow the bellow mentioned link for your preparation, we have more than 15,000+ fully explained MCQ’s along with past papers and MOCK test for NUMS test preparation. For more details you can call us at 0335-5833265. I have done O levels from Saudia Arabia but A levels from Pakistan will i be counted as a local student or an international student. We appreciate your interest in using pakprep.com. You will continue as Local student. Please follow the bellow mentioned link for your preparation. For more details you can call us at 0335-5833265. We appreciate your interest in using pakprep.com. Yes you can apply for NUST on the basis of 1sy year result if your part1 marks are 60% or more than you can apply for up coming NET in March. Your NET score should be around 145 in order to secure your admission. Please follow the bellow mentioned links for your preparation. For more details you can call us at 0335-5833265. Sir i am a student of Dae (power) specialization in auto And diesel i am in first year can i apply for the entry test after completion of my first year and what kind of courses can i apply And what will be the fee structure in case of good percentage or low percentage in entry test and DAE? We appreciate your interest in using pakprep.com. You are in three year degree programe so you can not apply after 1st year, however you can apply for it after passing you 2nd year DAE exams. Is it really 75000 per semester fee for NUST?? In some lists it is 95000. So tell me about correct dues..
We appreciate your interest in using pakprep.com. NUST per semester fee is between 85,000 to 95,000 depending on your program. They are also offering scholarships, however first step is to get good score in NUST NET to secure your Admission. Please follow the bellow mentioned links for your preparation. For more details you can call us at 0335-5833265. Aoa I want to know what is the fee structure for environmental engineering at bachelors level?? We appreciate your interest in using pakprep.com. NUST fee is around 85,000 to 95,000. Please follow the bellow mentioned link for your preparation. For more details you can call us at 0335-5833265. We appreciate your interest in using pakprep.com. You can apply for Bs electrical if your DAE marks are more than 60%. However you need to score 140+ marks in NET in order to secure your admission. Please follow the bellow mentioned links for your NET test preparation. For more details you can call us at 0335-5833265. What is the fee structure of biotechnology ? We appreciate your interest in using pakprep.com. Fee of NUST is around 85000 to 95000 per semester. Please follow the bellow mentioned link for your preparation. For more details you can call us at 0335-5833265. Sir my aggregate in nust is 73.43409090909091 , can i get admission in chemical engineering in nust? what are the chances? We appreciate your interest in using pakprep.com. 73% aggregate look bit low however lets wait for merit list may you get chance. We wish you best of luck. We appreciate your interest in using pakprep.com. NUST fee is around 85,000 – 90,000 per semester. Sir I want to take admission in nust so I want to ask that what is the requirement of marks in admission??? We appreciate your interest in using pakprep.com. For major engineering programs your NET marks should be more than 145+ in order to secure your seat. Please follow the bellow mentioned link for your preparation. Sir plz tell me the date of test for MBBS? And the last date to apply? We appreciate your interest using pakprep.com. NUST university is no more taking test for MBBS & BDS. Now NUMS university is taking test for AMC and other affiliated medical colleges. Please follow the bellow mentioned links for the preparation of FMDC test. Sir maary fsc part 1st main 311 marks hain aur nat main 47 kyaa main chemical engg main admission ly saktaa hoon. We appreciate your interest in using pakprep.com. Minimum 60% marks required to appear in NUST NET test. NUST university is not accepting NAT result you have to appear in NUST NET. Please follow the bellow mentioned links for the preparation of NUST NET. We appreciate your interest in using pakprep.com. Yes you can appear in all NET tests and NUST will consider only that test for merit in which you score highest marks. Please follow the bellow mentioned links for your preparation. Sir I want to get admission in b’s chemistry. Is nust offer admission in BS?? We appreciate your interest in using pakprep.com. NUST offering admissions in Bs Mathematics and Bs Physics only. We appreciate your interest in using pakprep.com. NUST is no more offering admission for MBBS & BDS. You can apply for MBBS admission on the basis of SAT score. What’s the fee structure of nust for BDS.. I want to do it private. We appreciate your interest in using pakprep.com. NUST is not offering BDS admissions. You need to appear in NUMS test to get admission in Army Medical College and all other affiliated medical colleges of NUMS. Please follow the bellow mentioned links for your preparation. We appreciate your interest in using pakprep.com. You marks should be 145-150 in order to secure your admission. Please follow the bellow mentioned links for your preparation. We appreciate your interest in using Pakprep.com. Admissions have been started and 2nd test will be conducted in March. Nust last test will be in June. You have to score 130+ marks to get admission in BS Physics 2018. We have all material which includes 15000 fully explained MCQ’s which helps you in the preparation of your Entry test. Please follow the below mentioned links to start your preparation. Please refer to the concern University official Website. Aoa…sir I got 770marks in my fsc…I’m interested in to do biogenetic from nust….what should I do to get admission on self?? admission. Try to score 150+ marks to also get some scholarship. mentioned links or call our helpline 0335-5833265. Please follow the NUST official website for details. Sir CAE RISALPUR ma as a paying cadet admission Lenayy k lye NUST ENTRANCE TEST Ma kitnayy marks required haiin?? We appreciate your interest in using pakprep.com. If you want to join as paying cadet you have to score at least 140 to 150 in test. But for exact criteria you have to check it from GHQ, because they set their own criteria for that. Please follow the bellow mentioned links for your preparation. We have more than 15000+ fully explained MCQ’s and MOCk test which helps you in getting good marks. Sir,I am studying in ICS part 2.My science subjects are Mathematics,Computer science and statistics. Am i eligible to apply entry test having statistics subject on the basic of part 1 result? please answer my question as soon as possible. But sir,i want to apply in software engineering. Is it possible to apply for NET or for get admission in NUST. Am i eligible to apply entry test in NUST having statistics subject in software engineering on the basic of part 1 result?